Take note, picture book lovers: There’s a new book in town. And you could win a copy. 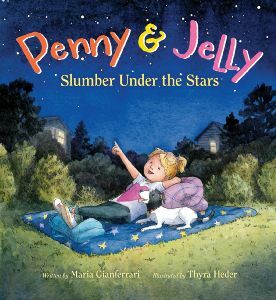 It’s PENNY & JELLY: SLUMBER UNDER THE STARS by the wonderful Maria Gianferrari who is so busy writing books she hasn’t had much time to slumber under the stars or anywhere else. We’ll hear more about all her books later, but for now, you should know that this book is a sequel to PENNY AND JELLY: THE SCHOOL SHOW. Maria graciously agreed to stop by Picture Book Builders and answer questions about this book and some of her many, upcoming titles. Read what she has to say, and then leave a comment for a chance to win a copy. Where did you originally get the idea for the dynamic duo of Penny and Jelly? And how’d you come up with such perfect names? The story was inspired by my daughter, Anya, and her relationship with our dog, Becca. Since Anya’s an only child, Becca’s like her dog sister, playmate, and best friend. Jelly was always called Jelly from the very first draft. I loved it, because it’s a funny name, and seems like the type of name a kid might give to a dog. Penny used to be Penelope, since the original manuscript was titled, Penelope, Untalented. However, since I was very fortunate to have received a two-book debut deal, we needed a more general title to carry over to the second book, and Penny & Jelly was born. I like how the names are reminiscent of peanut butter and jelly too. How did writing the sequel compare to writing the original story. Was it harder? Easier? Writing the sequel was definitely harder. What I most wanted to do was stay true to the best friends bond between Penny & Jelly, so it took a while to come up with a plotline that had the same emotional tone. Once I found the right one, it didn’t go through many drafts. Penny and Jelly have such a close bond. Is there a dog in your life? If so, are you his or her “main human”? Yes! Our dog, Becca, is a Dixie Chick rescue mutt from Tennessee. We got her when she was six months old, and Anya was nearly four, so they’ve grown up together. (Anya’s now 14, and Becca’s 10). I’m her main human, and she’s my main girl. We enjoy our daily morning and evening walks, and she keeps me company during the day. I write to the rhythm of her snoring. Are more Penny and Jelly adventures planned? I wish! I have ideas for more stories starring Penny & Jelly, but I have nothing more under contract. I would be a dream come true to write more, and have them illustrated by Thyra Heder—she’s rendered them with tenderness and humor. What other books do you have in the works? I have two other books coming this year. The first one is my nonfiction debut, Coyote Moon, with intricately detailed illustrations by Bagram Ibatoulline, which will be published by Roaring Brook Press in July; the other is Officer Katz & Houndini: A Tale of Two Tails, with hilarious illustrations by Danny Chatzikonstantinou, releasing from Aladdin in October. I have three more books under contract with Roaring Brook Press. In the spring of 2017, they will publish Hello Goodbye Dog. I’m completely in love with Patrice Barton’s illustrations! I’m also very excited to have Brian Floca as the illustrator of another nonfiction book, Highway Hawks. And I’m thrilled to have been paired yet again with Bagram for A Home for Bobcat, which was recently acquired. I also have a nonfiction concept book, Terrific Tongues, forthcoming from Boyds Mills Press as well as Whooo-Ku: A Great Horned Owl Haiku Story, in the works with G.P. Putnam’s Sons. What do you think makes a truly memorable picture book? A picture book that touches our hearts, with words that sing and images that shine, gets imprinted upon us. We want to read it over and over again to re-experience those emotions. Here’s a little more about Maria. She has two favorite stars: the dog star, Sirius, and Betelgeuse — just because it’s so fun to say. Maria stargazes from her background in Virginia with her husband, Niko, an amateur astrophotographer, her artist-daughter, Anya, and the dog star of the household, Becca. For more information about Maria, visit mariagianferrari.com. You also can visit Penny & Jelly at pennyandjelly.com. Thank you for stopping by, Maria! Best of luck with Penny & Jelly’s new adventure. Dogs, Fiction, Maria Gianferrari, Pat Zietlow Miller, picture book. Bookmark. Thanks for the great interview, ladies! Thanks for having me here, Tammi!! Love your books :)! 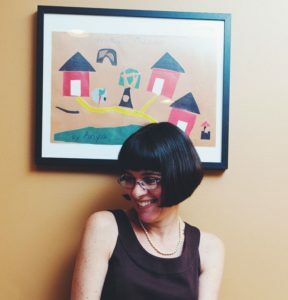 Thanks for hosting me Picture Book Builders, Pat (& the rest of the PB Builders!!) It’s one of my very favorite children’s book blogs, and as a regular follower, I always look forward to the titles you’re introducing me to! Wow, Maria–what an impressive line-up of books you’ve got in the works! We, too, have an only child who has grown up with “dog sisters” from birth (two different pairs), so I look forward to reading Penny & Jelly. Congratulations! Hooray for the dog sisters :)!! Thanks, Linda! Penny and Jelly are such a cute combo. I am looking forward to seeing their new adventure, as well as your other upcoming books. Maria, you are on a roll, girl! I LOVE Thyra’s art–it’s so perfect for this book, Sheryl!! And if you haven’t yet read her Fraidyzoo or The Bear Report, you will love them! I can’t wait to meet Penny and Jelly! Thanks, Lynne :)!! I hope you’ll like them! Maria, you are a woman on fire! Can’t wait to get my hands on your books. :)–thank you so much, Ann!! I love learning about other authors’ journeys and their books. Thanks! Thank you, Kate! Nice to see you here too! I love this thought: “A picture book that touches our hearts, with words that sing and images that shine, gets imprinted upon us. We want to read it over and over again to re-experience those emotions.” Thanks for the wonderful interview – and wonderful books! Lovely interview & I can’t wait to read about Penny & Jelly – the bond between children & their dogs is so, so special (and also the bond between write-at-home, dog-walking moms & their pups). Thank you for capturing this & congratulations on your upcoming books. Thanks, Patricia!! I hope you will like them!! And I do love my girls, two & four-legged :)! I will add this to my growing list of books to purchase for the school library!! How wonderful!! Thanks so much, Kiley :)! Great interview, Maria! I loved the first Penny and Jelly – I need to get my hands on the second! And so looking forward to all your other books!!!!! My kids love it! Keep up the good work and best of success to you. I’m glad to hear that your kids like The School Show–that’s great!! 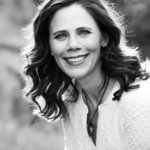 Thanks for stopping by this blog and commenting as well , Kelly!! Wow, Maria, you are a writer on fire! I’m looking forward to getting my hands on your new books. I read another post about these books recently and added them to my to-read list. Loved the interview. Congrats on all your upcoming books! You’re on fire with all those books! Congrats! Many thanks, Tina!! Congrats again on your recent success with Scholastic too :). I’m going to take a closer look at the Penny and Jelly books. Thanks. I’m really looking forward to the adventures of Penny and Jelly as well as your other forthcoming books, Maria! You’re on a roll, girl. Congratulations!